Performers include: Jerry O’Connell, Sydney Tamiia Poitier (as Sydney Poitier Heartsong), Kristian Bruun, Varun Saranga, Matt Baram, Brenda Kamino, Denis Akiyama, John Bourgeois, Joanne Boland, and Sherry Miller. A comedic Canadian crime drama from creator Garry Campbell, the Carter TV show premiered on Bravo in Canada, prior to its US debut. 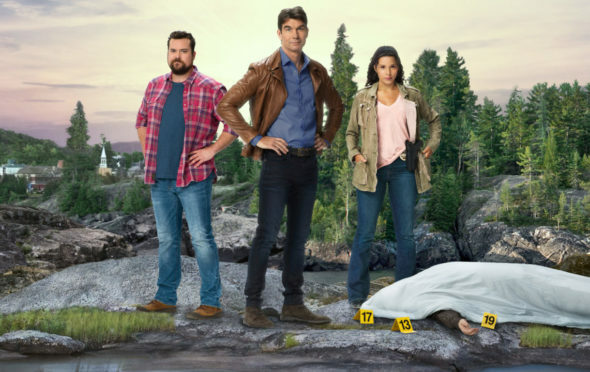 The series centers on Harley (O’Connell), a Canadian actor who enjoyed success as the lead of a hit American detective series, Call Carter, until indulging in a big, embarrassing meltdown. Now back in his quiet hometown of Bishop, Harley is putting his acting skills to work as a real detective. Working side-by-side with his best friends, Sam Shaw (Portier) and Dave Lee (Bruun), Harley realizes he has a knack for detective work, but he still has to prove himself. He also knows he has to reclaim who he was, before fame changed him, and spending time with Sam and Dave is just what the doctor ordered. A former military officer, Sam returned home to take care of her mother. After joining the police department, she rose quickly to the rank of detective. As Harley’s oldest and closest friend, as well as his mutual childhood crush, she has been privy to all the big moments in his life. While his marriage, fame, and distance separated them, now that they’re back together, it feels like they never parted. Sometimes it also feels like they’ll never really get together, either. Completing the trio is snarky, witty Dave, who owns a coffee truck — the “Perk and Park.” He was hurt when Harley left Bishop for the bright lights of L.A. and was furious when he named a sleazy Call Carter character after him. Dave has had his own “dark years” which included struggles with pain killers, after an ACL injury ended his football aspirations. Now that he, Harley, and Sam are working through the things that strained their friendship, Dave realizes how much he needs his friends’ support. When Harley’s mother died, his grandparents weren’t able to handle bringing him up, so her housekeeper Dot Yasuda (Kamino) raised him. She’s had her own brushes with the law, so sometimes it’s a bit strange that Harley is now working with the Bishop PD, but she’s always concerned with what’s best for him. Meanwhile, her husband, Koji (Akiyama), who originally trained as an engineer before coming to Canada, is always coming up with handy inventions to help Harley. Although Harley’s mom disappeared when he was still young, he has tried not to let his tragic past affect his outlook. Still, this charming, bright guy, with an incredible memory, did allow himself to get a bit spoiled by show-business success. Now he’s torn between remaining as a Consulting Detective to the Bishop PD and returning to the glitz and glamor of Hollywood. One big factor Harley has to consider is the continuing mystery of his mother’s disappearance. It’s always on his mind, and as things start to resurface, it further complicates his feelings. What do you think? Do you like the Carter TV series? Should this WGN America TV show be cancelled or renewed for another season? More about: Carter, Carter: canceled or renewed?, Carter: ratings, WGN America TV shows: canceled or renewed? Please renew, I enjoyed Carter! I love this show! Please renew it! Hoping for the next season to start soon. An entertaining, enjoyable show without mass murders & drug lords. Absolutely refreshing! My wife and I love the show. Hope it gets renewed. I love the show, it’s well written and the characters are great! I really hope it gets renewed since I’m tired of the boring reality ones that are on now. Need season 2, tired of reality shows that have 30 year old people acting 3 or 4 years old. They tried to make Carter’s character cartoonish which to me spoiled the show. He would run off after the bad guy with no planning or any idea of what he would do when he got there. It could have been a good sitcom but they tried to hard to be funny. I enjoy the quirky personal connections in the investigations. keep them coming. Really enjoy the show! Please keep it going!